If you’re looking for a few quick fall craft ideas, Gloria and I have four to share with you that are not only quick, but are easy and fun. These were all created by starting out with purchased craft supplies and then embellished in our own way. You can tell which one of us is the more artistic one. When Gloria sent me photos of this adorable chalk board cutting board, I asked if she had taken before photos of it. She had not. Her reasoning was it was so easy, she didn’t think it was something we’d want to post on the blog. I disagreed! She purchased the chalkboard cutting board at Michaels and free handed the design on to it. 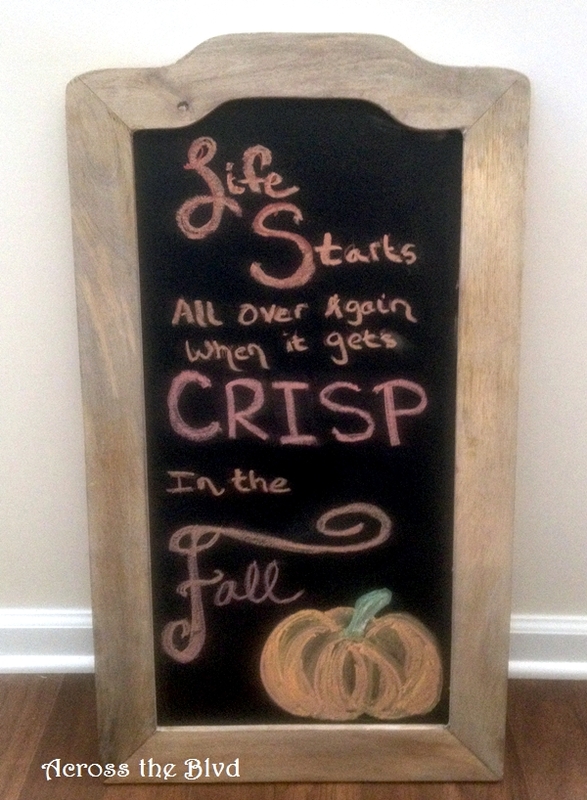 She bought this larger chalk board from World Market and again, she free handed the design. I mentioned that I thought the pumpkin looked great and she said that was the easy part. Clearly, she is much more artistic than I am! This pumpkin cutout is something I purchased at Jo-Ann Fabrics and Crafts. It was unfinished wood. I painted it using Waverly Chalk paint in cashew and sanded it to distress it a little. I used a piece of felt and added a lace overlay for backing and glued it to the back of the pumpkin. Chip board letters are glued to the top. From start to finish, this took about 15 minutes. 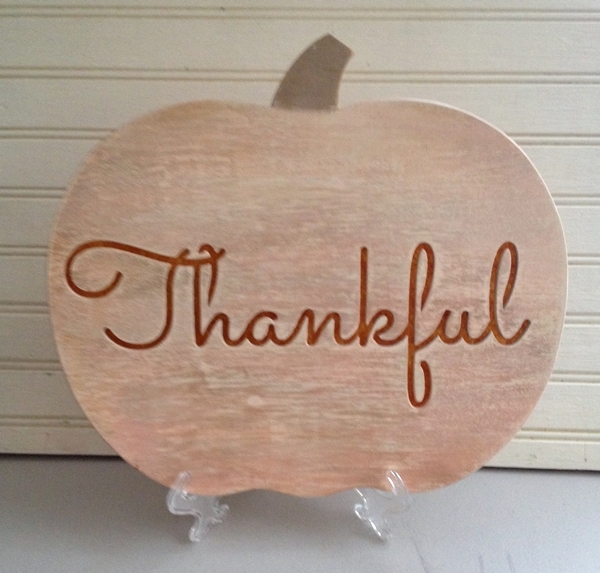 Another purchase from Jo-Ann Fabric and Craft is this Thankful Pumpkin. I also painted and sanded the wood. I gave it a coat of peach chalk paint, followed by a coat of cashew chalk paint and then sanded it. I added the same color felt as I used for the cutout pumpkin to allow the word to stand out better. We’re both happy with how our quick and easy fall crafts turned out. 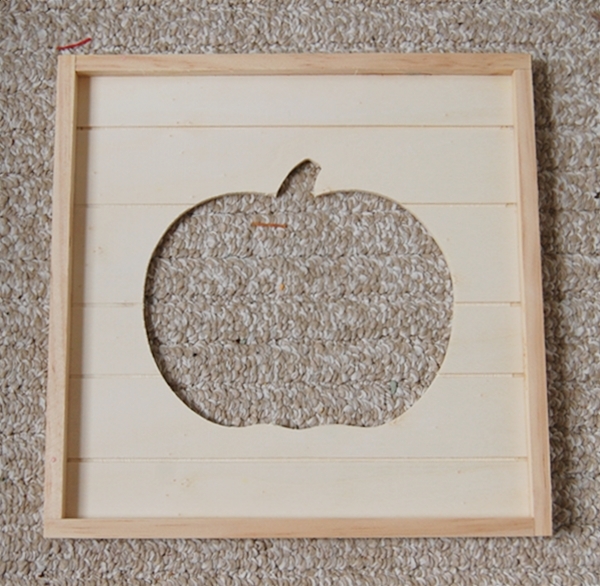 What’s the easiest fall craft you’ve made this season? 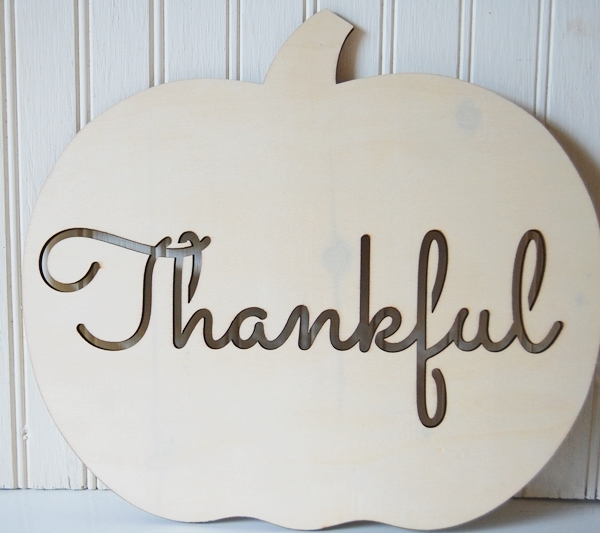 I love the “Thankful” craft you’ve made! I’m thinking of making a wind chime. I’m still gathering some ideas on how to make it. Thank you. A wind chime would be a fun craft to make! Thanks for stopping by, Linda and thanks for hosting the party! 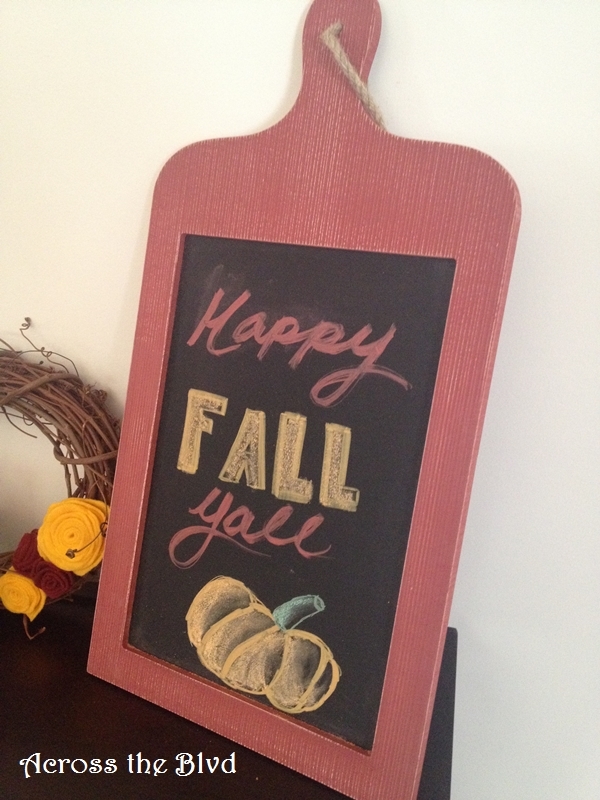 I’m ready for some fall like temperatures to go along with my fall decor! Love these fall decorating ideas!! Thanks for sharing! ! Thanks so much, Keri. I loved how easy they were to make! Cute ideas for simple decor! For me, life starts over again in the spring. Isn’t it funny how each of us has our own tastes? Thanks, Jamie. Yes, I know lots of people who love the spring more than the fall. I’m more of a fall person. Thank you, Kelly and thanks so much for sharing! These are all great projects for the fall, and would be easy. Gives me some more ideas. Thanks for sharing at Snickerdoodle Sunday. Pinning and sharing! Thanks, Linda! I’m happy to have given you some ideas! Thanks for sharing. They’re all looks so nice and creative 🙂 I think my favorite is the last one – Thankful. But the 1st one has great colors. Thank you, Winnie. I love the colors in the one Gloria made, too. The Thankful one was super easy! These are such fun and quick projects! So glad you decided to share them. Thanks, Laurie. I’m glad you like them! Hope everything is going great for you! 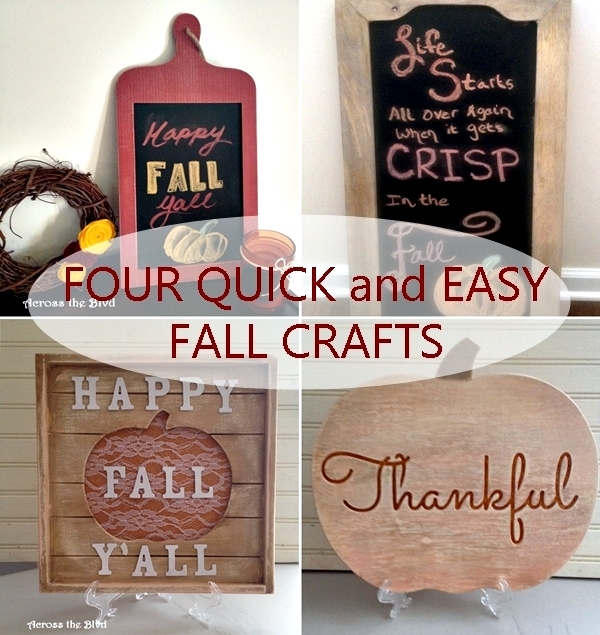 I love these easy to make crafts that are perfect for fall and thanksgiving. We can’t wait to see what you share with us again! Thanks, Julie and thanks for hosting Cooking and Crafting. Thanks, Jess! And thanks for hosting a fun party. Thank you, Sue. I’m happy to share at Anything Goes. Thanks for hosting! great Fall Projects!! Love them!! Thanks so much for stopping by!! Thanks, Debbie. It’s always a treat to stop by and see what you’ve been up to. 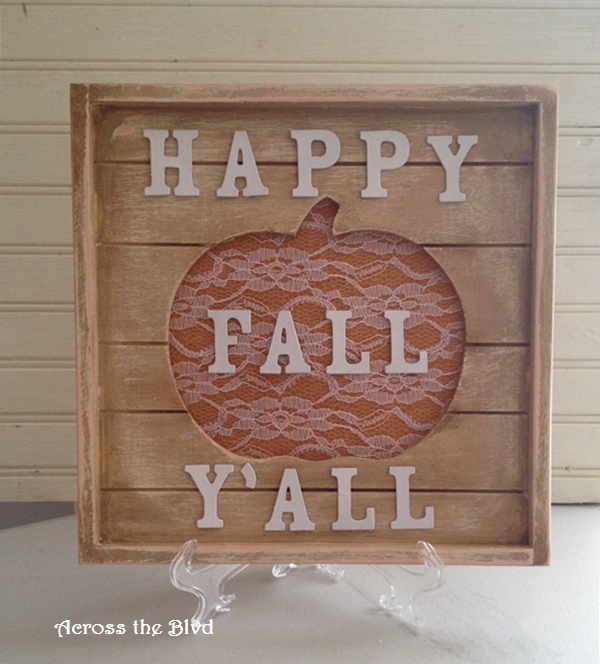 They are all wonderful crafts but I think my favorite is the “Happy Fall Ya’ll” wood sign pumpkin cut-out! Pinned and Tweeted. Thank you for sharing at Merry Monday! Thank you, Amanda. Thanks for sharing, too. I’m always happy to party at Merry Monday. These are all so pretty, perfect for fall! Thanks for sharing at What’d You Do This Weekend?! Thank you, Joy and thanks for hosting a great party! Thank you and thanks so much for hosting a great party and for the shares. Perfect craft for the fall Beverly. Might be quick for you but would take me forever. Thanks for sharing at #Throwback Thursday. Please join us again and remember this week will focus on Thanksgiving recipes. Thanks, Quinn. That’s how I feel about your amazing recipes! Thanks for hosting and I’ll be sure to stop by this week’s party.